FAQ-Information on the EasyInstall System EDIABAS DIS GT1 & SSS Progman. The following are some of the more frequent questions we get asked about the diagnostic system installation. One thing we can tell you is that when the computer has been used for a long time, with frequent program installations, deletions, there are frequently issues with the install. We always recommend for simple use a dedicated workshop computer, no special firewalls or anti-virus applications, at least Internet Explorer 8.1 as the base install (or our install will not work properly). Best choice is a few year old laptop with Windows XP Professional, service pack 3, most important security updates (though we've done installs on systems with only the clean install with the minimum updates to go from Internet Explorer 6.1 to 8 and the .Net framework 3.5), a 100+ GB hard drive, 2 GB RAM, a screen with 1024 x 768 display resolution, a real RS232 serial port, and an internal (or external) DVD drive. What cable is the "right" cable? The correct cable is one that matches your car's diagnostic interface. This could require a 'standard 9 pin RS232 Serial connection on the computer when diagnosing an early car with ADS, for later cars, either Serial or USB is acceptable. I always recommend a serial connection for ease of use, stability and security when possible or available for your car. However, there are many cars that will require DCAN cables, and those are exclusively offered in USB. For K-Line (came between 1997 and 2006/7) there are both types available. If you have a 1997 or newer with both the 20 pin under-hood and the standard OBD connection under the dash, you will still need the 20 pin 'Pac-man' connection under the hood to allow the GT1 DIS or SSS Progman to communicate. There are many variables at play when selecting the right cable, and if you have any questions please contact us for guidance. Where can I get this cable? There are numerous versions of this type of cable available on ebay , and from retailers such as do-it-auto.de (a German company, but one that has all the available connection types, Serial, USB, Ethernet, ADS/ODB, K+DCAN...) and even One-Stop-Electronics, whose offerings are basically identical to the do-it-auto.de store. For those with "ADS" cars there is the American Open labs - they offer only a dedicated ADS serial cable. Why is there a version for BMW and Mini and one for Rolls Royce? Due to limitations with the DIS and the SSS Progman you can either install BMW alone, Mini alone, Rolls Royce alone or BMW and Mini together but without Rolls Royce. This is built into the DIS installation by BMW and requires running two sets of DIS and SSS Progman IF you need both varieties. We will offer a substantial discount for those who buy both installations however. Please contact us for more information. One important note is that the EDIABAS software is identical for both installs, so the raw data exists in the data sets for all supported models including Rolls Royce. Help with the installation and configuration is readily available, either by email or by utilizing remote access to your system across the internet using TeamViewer this link takes you to the TeamViewer download page. For the specific file from TeamViewer for remote support click TeamViewer 11.x Installer. By far the majority of our users are able to install and get connected without any issues. But if you have a problem we are here to help. Note: we are licensed for TeamViewer 11 or older. Please do not update to a newer version if you need support! What is the update to the EDIABAS? Do I need it? The EDIABAS system is 'as delivered' on CD to users. It has some ECU's (many of them actually) and a fair amount of data for your use. However it is not complete. The WinKFP/NFS system in particular has no data included with the base EDIABAS 6.4.3/6.4.7 installation. This is because the data set for all the models supported consumes at least 10 GB of space, and is updated at least yearly. We have sourced the last data set that was appropriate for this software (which is intended for 2009 and earlier BMW and Mini vehicles) and incorporated the data correctly (ensuring only the latest version of a given ECU is installed in the package). We include a utility (used for getting updates to our system when appropriate) that also has provisions for you to download the updated EDIABAS image. You can update the basic EDIABAS which is a fairly small download and doesn't require much more space than the basic install but does not include the WinKFP/NFS data set) or the complete EDIABAS update, with the WinKFP/NFS update (over 10 GB decompresses - about 2 GB compressed for downloading) or lastly, if you choose to download the basic update and want to later add the WinKFP/NFS system, a download for just that portion of the EDIABAS system. Do you need it? 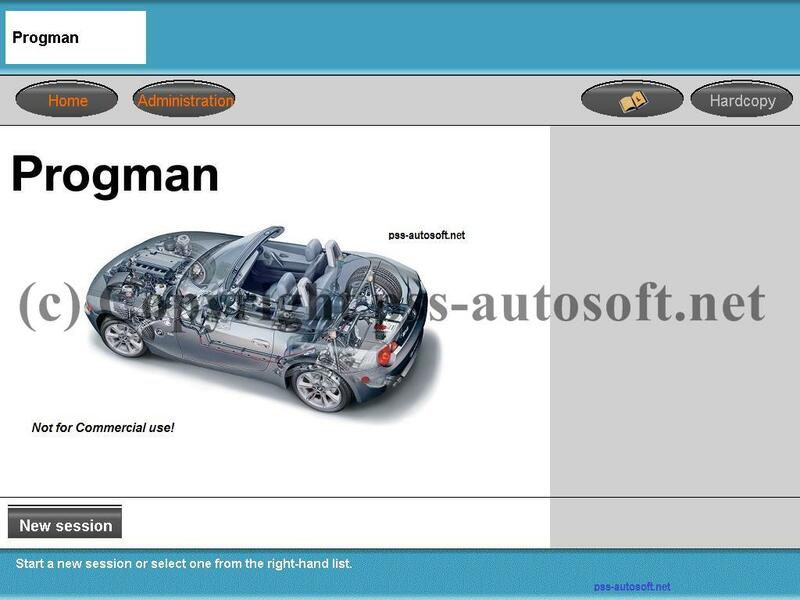 If your interest in the EasyInstall system is to access your car using the DIS or SSS Progman, then no. You can ignore this update. However if you later find that you need more access to the car's systems, the EDIABAS applications may become more necessary. One last note, these downloads are occasionally updated. If you find you cannot access a particular file we may have updated the link. Contact us for the latest download information. What kind of computer do I need, really? Screen display of at least 1024 x 768. Larger is better. Minimum of FULL 1.5 GB RAM For Windows XP. (3GB is much better) For Vista, Windows 7 or Windows 8.1 2GB is absolute minimum. Again, more is better. Hard Drive that after the OS is installed, has at least 45 GB free, as the Virtual machines will consume most of that. Add about 45 GB if you intend to use the complete updated EDIABAS system (requirement includes optional downloads for the full assembly line data for the WinKFP/NFS system, base update is less than 2 GB). CPU that is fast enough to suit your need for speed. Faster is not always better in a laptop though. CPU must be VMware compatible. If in doubt, ask! Good battery in said laptop to keep it running if or when the external power fails. Free USB 2.0 port if using a USB interface. Wired Ethernet port if using a OEM interface. Operating System that we created an install routine for. Windows XP 32 Bit (prefer it have SP3. See above notes on why XP might be required). Windows 7 32 or 64 Bit. Windows 10 32 and 64 Bit. Windows 10 does work, but we do not recommend. What is VMware Player or Workstation and why do I need it? VMware is a Virtualization and cloud computing software provider for x86-compatible computers. VMware Inc. is a subsidiary of EMC Corporation and has its headquarters in Palo Alto, California. VMware Player, which stands for "Virtual Machine Player" (or VMware Workstation) is software installed on the host computer that can "host" other operating systems in such a way that each operating system behaves as if it were installed on a self-contained computer with its own set of programs and hardware resources. We use this to run the Virtual Machines GT1-DIS and SSS so that they believe they're standalone computers in their original format. The DIS software is run on UNIX and the SSS runs on Windows XP Embedded. VMware Player/Workstation allows use to use one computer for all three. Why shouldn't I use my existing fast computer that doesn't have a serial port? Ah, the most frequent question I get. There are two answers to this question. The first is: If you have the right supporting software already do not have too much of the wrong type of software already installed on your newer, more powerful laptop you could use it with a USB interface just fine. That is as long as you never want to diagnose an ADS car. The ADS interface is hard-coded to COM port 1 and a USB to serial emulator rarely (if ever) works. However there are drawbacks to using your daily use machine for diagnostic services. Now, the second part of the question: I don't have an ADS car so why use a serial cable interface and not USB? Well several reasons but the most important is (to me) reliability. All after-market cables (up to the Ethernet version) are ultimately serial cables. The USB versions use a special chip on the diagnostic head to convert the serial signal the EDIABAS head (which the EDIABAS chip in the diagnostic head converted from the car's communication) to a USB format. Then the USB transmits the data to the PC where the USB software converts it back into the correct serial format for the diagnostic software to interpret with the EDIABAS software. When you use an older laptop with the USB cable with the EDIABAS software, you are asking the machine to communicate with your car and not drop any data when processing for two additional steps. You see, the straight serial cable gets the serial signal direct from the EDIABAS head then delivers it to the EDIABAS software on the PC without the two added steps. Sure, it can work almost all of the time. However sometimes the fancy USB cables have been known to drop data, lose the connection, or otherwise fail. Then you have the potential of a very expensive OEM ECU in your BMW or Mini to replace and code from scratch. Sure, sometimes they can be recovered, but not always. The factory BMW software with the subsequent porting to the Virtual Machines we use was written specifically for a RS232 connection to the host computer. Since then, people have provided software EMULATORS to fool the host computer into believing it is talking to a RS232 Serial port, when in fact it is not. Second reason, slightly less critical if you are always careful of the computer is that the real serial cable connection is able to be screwed into the laptop. You cannot accidentally pull it out when moving the laptop around the car. Last reason is one of practicality, most of our regular day to day laptops have seen a bit of use, have been customized to meet our daily needs. This means things like custom firewalls, special browser configurations, special networking settings that we will by installing our software change. This installation changes the Windows network configuration, changes the firewall settings and of course adds several other applications all to make the BMW diagnostic software work properly. Which may cause something to fail you would rather not see broken. Again, this is why we recommend a fresh install of Windows (or at least reasonably fresh!). If you have a new laptop with Windows 8 on it we do not support the Windows 8 operating system. Though we do support Windows 8.1. (and we know that the system works with Windows 10, but cannot recommend it). Hello, I have a 2008 Mini Cooper (R55) Clubman and I want to purchase the correct software and cable. Could you direct me to your correct product and a cable recommendation? The software will work for a 2008 Mini, BUT there are some potential issues you must understand before you purchase this or any other software - the software in your car has what is known as an integration level; it left the factory with a certain I-level, and anytime it was coded using the dealer diagnostic system (not diagnosed and clearing of errors, but amending the code in the ECU's - i.e. updates to the software) the I-level could change IF the dealer had a newer software level. The SSS Progman we include contains the very last data that was available from BMW for all the ECU's and covered all 2008 model year cars. However, if the vehicle was later serviced (and coded) by a dealer with the replacement for the SSS and DIS - that is ISTA/P ISTA/D - then there is a good chance that the car has newer software than what is included in the DIS or Progman. This does not mean that you cannot use our system, it is modular and we also include the factory tool-set (EDIABAS) which is agnostic as far as I-Level. This though means that you need the correct data incorporated into the EDIABAS system which we include as a matter of course updated data through 2008 as an optional download, but we also can update your system with data up through 2015 if you so desire. Note that the update to this newer system IS included (meaning we aren't charging you for it) but it IS ADVANCED and will require more knowledge to setup the system. Since people need access to the newer data in EDIABAS and the older data in DIS & Progman, we created a method to allow both early and late EDIABAS systems to coexist on the same machine. This was required due to the newer EDIABAS systems being incompatible with the DIS and Progman, and the older EDIABAS is often incompatible with the newer data sets. So, I've laid out the issues. For a cable, you need a good quality DCAN (or K+DCAN) cable for a 2008. Please look at my 'Collections' page to see some recommended vendors for cables. I have a 2010 650i convertible would this work on diagnostics coding? Unfortunately the short answer is no; the DIS and Progman included are the latest versions available, however they will only code cars through 2008 (and occasionally some of those are also un-code able too). The part of the programs included that will work is the EDIABAS tools - The NCS Expert, INPA, and WinKFP. Those do diagnostics and coding as well, but they are much more hands on than the DIS and Progman. DIS/Progman were intended for use in dealer workshops and are fairly user friendly and make if (more) difficult to make an error that can 'brick' your car. EDIABAS tools are for the Factory - software developers testing ECU coding and those doing the initial coding for new vehicles. So this software has far more power than the DIS or Progman, but generally is very task specific. Generally you are working with only one ECU at a time in other words. Plus there are far more opportunities with the EDIABAS tools to seriously break something. The EDIABAS as delivered does only include the data BMW included with their actual installation CD or Programs. However I offer as part of the system (as a down-loadable options only) data through either 2008 (to match the data set included with the DIS v57 and SSS Progman) or for advanced users a newer version of the EDIABAS that includes data through 2014. This is also included for people who really need it, but it is still (from a delivery standpoint) in its very beginnings. The system once installed is very functional, but the delivery system is still undergoing testing. Generally I have been performing those installs using remote access to ensure there are no issues. (And for the majority of my customers it's superfluous since they don't normally have the newer cars that require the newer data). If you would like to know more please contact me through my web site contact page. I have a 2006 BMW M6 E63, what cable do I need? For your car you have a choice of two basic non-OEM cable types: Serial K-Line (almost all will be ADS/K-Line 'combo' cables) using a computer with an actual physical serial port. Advantages: No extra drivers getting in the way of communications. Security - the cable can be securely connected to the computer. Reliability - the cables only do EDIABAS communications, no translation from USB to serial and serial to USB. Disadvantages: Only compatible with cars from (about) 1987 to before 03/2007 production dates. ---- USB K-Line (almost all will be K+DCAN 'combo' cables) Use any computer with a USB 2.0 USB port. Advantages: Every computer modern computer has a USB port. Allows a wider selection of cables (though note my comments on cheap cables I made earlier) Disadvantages: Requires 2 adapters for full K-Line support. USB cables come out of the computer too easily in some instances - which is rarely a problem on your desk, but in a car you often are moving the computer around while working on things, and you risk bricking an ECU if it comes out at the wrong time. (Though when diagnosing it doesn't matter so much, when coding/programming it does matter.) Drivers add complexity to solving connection issues. (Is it the driver? the cable? the configuration?) EDIABAS head now does EDIABAS communications AND convert serial signal to USB and vice versa. This adds heat to the EDIABAS head, and cheap ones WILL fail eventually. USB 3.0 ports may/may not work reliably with the USB 2.0 cable. K+DCAN cable offer two 'speeds' of communication from head to car - getting it set correctly or forgetting to set it at all is a common problem. From the two vendors mentioned in my collections page, they both offer the K-Line cable as a ADS/K-Line combination in serial, and K-Line DCAN in USB, they both offer good cables and have been in business of selling like products. If you intend to work ONLY on 03/2007 or older BMW's the serial option is best. Will I need a yellow head DK or the KWP2000 plus interface to make this work? No, you do not have to use a DK or other OEM BMW diagnostic head such as the OPS or OPPS with this software, though it does support them if you choose to use such. You can use any of the commonly available after-market cables as well. I am unfamiliar with the KWP2000 Plus interface, so cannot comment on it. For any connection type the year and specific configuration of your car or cars is really what drives the decision. 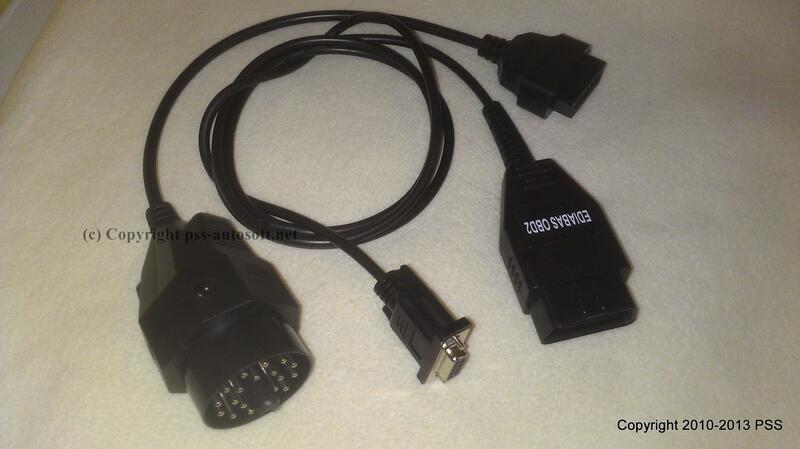 After-market cables: For early cars (up to 1997 or so) you need an ADS compatible serial cable. For cars post ADS up to 03/2007 you would need a K-Line cable For DCAN cars (after 03/2007) up through the end of the years this system supports you would use a DCAN cable For early ADS and K-Line cars there are serial combination cables with switch control to the type interface connected. For later K-Line or DCAN cars there are USB "K+DCAN" cables that use software to change the cable mode. Or there are a variety of specific single interface ADS, K-Line cables (though none that I am aware of that are strictly DCAN). Note that if you have any question on an early car being ADS or K-Line as the changeover was supposedly 1997 but I've had customers claim their 1996 was K-Line and some with as new as 1999 Z series that are ADS so getting a combination cable is not a bad choice. There is a test that seems to work the majority of the time for determining if it is ADS or not: Open the 20 pin DLC under the hood, find pin 15. If it is populated with a connection, check for voltage with a volt meter. With a fully charged battery an ADS car will have approximately 11 VDC at this point. I can't claim this as a foolproof test, but it seems to be accurate in the majority of cases. Of course, if there is no connection point (it is a 'female' receptacle) or there is no voltage, then it is not ADS as pin 15 is the data line for ADS. For OEM diagnostic heads: Early Non-MOST K-Line/ADS cars can use the DK and Later DCAN or MOST equipped cars can use the OPS or OPPS. I am having problems with the installation! When I try to register the system is says my serial number or password is incorrect. Did you send me the wrong information? While it is possible that we have made an error, we have procedures and safeguards in place to keep that from happening. The probable cause is simple: There is an incompatible anti-virus or antimalware program installed. We discovered that our registration decryption technique is blocked on any machine running any of the incompatible anti-virus programs (that was an accident, but it turned out to be useful). By incompatible anti-virus or antimalware we mean that it is a program that WILL interfere with the BMW tools. Because the BMW tools were written in the very early 1990's long before there were common issues with or defense against viral infections, the BMW tools do NOT play well with most any anti-virus/antimalware programs. If this is a concern, we recommend that you install the system onto something that will NOT be connected to the Internet as a routine matter. We do know that the Microsoft Security Essentials or Windows Defender tools are completely compatible with the BMW tools. When installing, I don't see any icons created as shown in the installation instructions, and some of the actions don't occur at all. These are a couple of possibilities that you might have occur. First, are you logged into Windows as Administrator (or as an Administrative User)? If not you may (depending upon the version of Windows installed) have this problem. On Vista, Windows 7, 8.1 and 10 deactivate the UAC (User Account Control) to eliminate those annoying pop-up warning while we're installing. Under the UAC's most restrictive settings, installation will fail, sometimes silently. So we recommend completely disabling it. Note that some of the BMW tools are old enough that the UAC MUST remain disabled for them to function correctly. When I get to where I am supposed to see the new configuration, I don't see any settings or incorrect settings for the VMnet1? What has happened? The VMware is not installed, or was improperly installed. When installing use the defaults for the versions we recommend. We have tested this with the VMware player 3, 5, 7 and Player 12 as well as VMware Workstation 6.5, 7, 9, 10, 11 and 12. If you have another version of Workstation that is newer, please contact us. For the VMware Player please choose one the ones listed to ensure compatibility. When extracting the SSS/DIS/EDIABAS from the BMW Master DVD, it stops and gives me message "Incorrect Function", or I see a CRC error. What does this mean? This happens when the DVD reader you are using fails to properly switch to the second layer in the Dual-Layer DVD. This can happen if the DVD reader is older, and/or is not in perfect condition, or is incompatible with Dual-Layer DVD stock. There are three ways to get around this; copy the file using the drag-and-drop method to your C:\BMWISO folder and contact us to help you extract the file, Swap out the DVD reader for a functioning model (when copy fails as well, this is the only good, fast option), or contact us to arrange a download of the SSS file from our server. The files are encrypted, so we will need to assist in the extraction if done manually. The problem could of course be a scratched or dirty DVD, but usually it's fault of the reader. To try and eliminate some instances of this issue occurring we have modified the compressed files to attempt to overcome this in the majority of instances. I wanted to copy the virtual machines to another machine and I can't open them without a password. What gives? All the files included on the installation disk are encrypted. The only way to extract them is to use the installation program included. If you have the previous issue, we do have a method to extract them or download them direct from our server and then extract them. Please contact us for further information should you encounter this issue. Why won't my Windows computer talk to the BMW or Mini? Probably we'll need a bit more information to troubleshoot the issue. But in general we've found that when you have a computer with an Operating System that is not really close to 'as installed', or has proxy server, non-standard networking configured, or has a restrictive anti-virus application, things don't always work. This is why we really recommend that your computer be a dedicated machine for the workshop. Not your everyday computer used for surfing the net, email, downloading torrents, etc. Why won't the DiagHead application load? Well, this is really pretty simple to fix. And is most common on Windows XP installations. The computer doesn't have the correct level of the Microsoft .NET framework installed. The minimum level is 2.1 but as it seems that it is not available, install the 3.5 version. The problem occurs on fresh installs of Windows where the Automatic Updates is turned off or when set to only give important updates. (Which is how we usually prefer our systems actually!) You can get is as part of running the Windows Update or from Microsoft by clicking this link: Microsoft .NET Framework 3.5 (Note this will open a new browser window). If you have Windows 8.1 or 10 the operating system will even find and download and install the .Net framework the first time you attempt to load the DiagHead software. Do I really need the DiagHead application? Well no, actually you do not need it. But the way we have configured the system, it must be loaded to talk to the car with the DIS. The SSS Progman never needs it. If you are going to use an ADS cable, we will gladly tell you how to configure the system without the DiagHead. But it does no harm, and helps you see that the head is connected to the DIS. Why can't I print from the GT1 DIS? If you are running a 64 Bit version of Windows upon install you received an error installing the WinLPD application. This is because the WinLPD port monitor is a 16 bit application and Microsoft removed the ability to run 16 bit applications from the 64-Bit kernel. As of June 2014 we have included a solution to this issue under any version of Windows we support. If you are a registered user that has the WinLPD and would like to update, please contact us. If you are running a 32-Bit version of Windows no update is necessary. The NCS Expert will not run. Why? This is another case of the Microsoft removing support for 16 bit applications from the 64 bit kernel. For advanced users needs we provide the EDIABAS update which includes a version o the NCS Expert Tool that will work on a x64 platform. If requires a bit more knowledge and care in using to make it properly integrate into the EasyInsatll System. If interested in learning more please contact us for details. I can't get my cable to talk to the programs. Why? Well, there are several possible reasons. The Cable Select program must be run to provide the initial installation configuration for your cable. It requires that you have already installed your USB cable (and the drivers) and that your cable is either USB using the FTDI chip-set or a serial cable (either ADS or K/DCAN). If you have an ADS cable, select the ADS and COM1 from the Cable Select options. If you have and K, D or K+DCAN cable, select the appropriate settings from the Cable Select options. If you are using a USB cable but don't know the COM port assigned, the pull down list will only show the installed real or FTDI based COM ports. If you have a USB K+DCAN cable the correct interface speed settings must be set using the D-CAN switcher program. Generally this needs to be run within one minute of connecting the cable to the computer and car (while the LED light is still illuminated on the diagnostic head). For K-CAN cars you need to set the speed to 100 kbits/s and for DCAN cars 500 kbits/s. If you still have an issue connecting, ensure you have only one installation of the EDIABAS system on your computer. The Windows path is set, and if your path points to the wrong install, it will fail to work in most circumstances. Has the SSS Progman the voltage fix in it for coding and programming or updates? I ask this because my previously purchased SSS Progman (from another seller) has a 12.4 voltage problem and I cannot update my modules. The answer is absolutely yes. For versions of Progman you obtained elsewhere what you are experiencing with this other version is actually quite common. In my system Progman is fully functional for any supported cable or diagnostic head type. For OEM heads such as a DK (Yellow Head), OPS and OPPS it uses the built in Progman software to correctly read voltage. For non-BMW heads (K-Line, K+DCAN cables) the Progman has been modified to have "detected" a constant voltage high enough to keep coding tasks from failing. We provide a application build into the SSS to allow the user to easily change from OEM heads and K-Line (for EDIC emulation) and DCAN (for OPS emulation) to ensure proper voltage reporting to Progman (that is to say either real voltage from the OEM head, or 'fixed' voltage for after-market cables). Note that you MUST use a proper power supply when coding with an after-market K-Line or K+DCAN cable as there is no way Progman can really protect you from attempting to code without sufficient power available from the vehicles battery. Failure to heed this can cause you to 'brick' systems. Your car at the worst case, the ECU being coded at best. My DIS and SSS run realllly slow. Why is that? TThe issue here can be many things; slow CPU, low usable RAM for the operating system... But here are the two most common issues. First is the computer not utilizing "Virtualization". While the system can be installed on any computer that supports VMware correctly, there are VMware versions that run on computers without Virtualization support, and versions that require support for Virtualization. In order for the virtual machines we provide to function most efficiently, your computer should support either the Intel Virtualization (usually shown in the BIOS setup as "Intel VT" or "Intel VT-X") or AMD's version of Virtualization (usually named "AMD-V"). There are two important things about this: On older computers that did support Virtualization, the BIOS (the basic input output system) defaulted to "Off" or "Disabled" for the Virtualization settings. So it must be enabled to make use of the feature. Most modern systems the default is "On". The second issue is that there were many older CPU's that had zero Virtualization support. And while a line of computers, say from Dell, would have some systems with the CPU that did support the Virtualization, they may have had some in the same line that did not. The second issue that can really affect the speed of operations on a virtual machine is the host computer's hard drive. If the hard drive is badly fragmented then the virtual machine performance suffers greatly. Any disk fragmentation over 1 or 2 percent will cause noticeable slowdowns. It is not uncommon to see fragmentation rates as high as 40% (or more) on systems that have been in use for some time and the virtual machines are added. I installed the EDIABAS update you provide, and now a lot of the things seem to be in German. Why is that? This is due to all the BMW provided data updates that are independent of an EDIABAS update come in the German language only. This really only affects the EDIABAS "INPA" Tool as every other EDIABAS tool the language is built into the interface, where INPA is dynamic and the various screens are built independently by the EDIABAS .IPO data files. There is really nothing simple you can do about it - other than reverting to the older data from the OEM installation. And frankly, that doesn't even really help as there are just some parts of the data that were never translated into English in any iteration of the data. For example, the BMW E46 had an 2 liter diesel known as a M47. The data files for this engine are only offered in any data set as German. It is important to know that if you choose to update the data sets yourself at a later date, that you MUST start with the Metric version of the files - either from a base English (UK) EDIABAS installation, or the German language version of the installation.